Responding to a Freedom of Information request submitted by The American Immigration Lawyers Association Liaison, USCIS revealed interesting data on L-1B nonimmigrant petitions receipted, approved, denied, and those subjected to a Request for Evidence (“RFE”) for FY2012 and FY2013. The data, when compared with USCIS statistics and a National Foundation for American Policy report, both released in 2012, reveals that the L-1B denial rate increased from 27% in FY2011 to 30% in FY2012 and 34% in FY2013. Another point emphasized by the same data: U.S. Immigration Law has become substantially regionalized and USCIS’ adjudication criteria inconsistent. 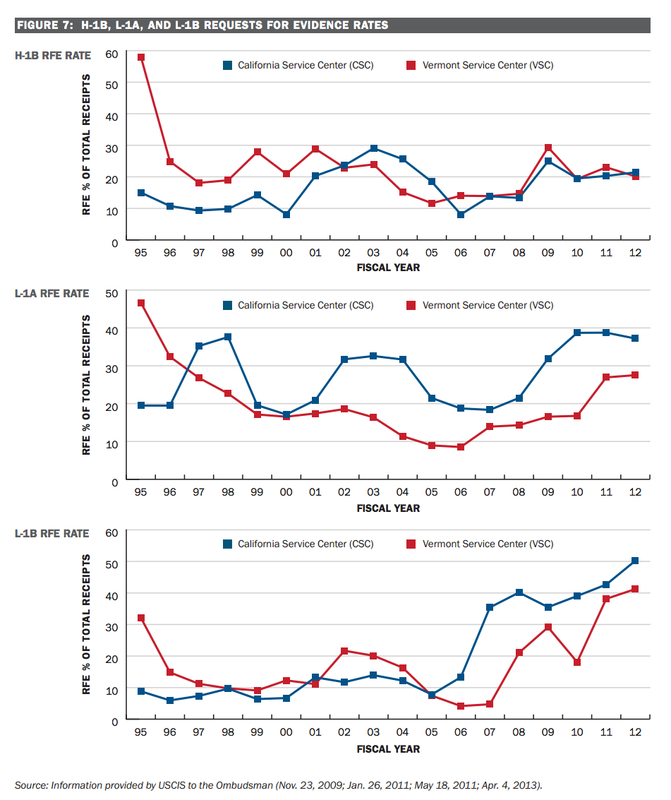 RFEs are issued by the California Service Center at disproportionately higher rates than the Vermont Service Center. This is also true in the CSC’s adjudication of H-1B and L-1A cases per the June 27, 2013 CIS Ombudsman’s Report, below. In recent years, U.S. Immigration policy has repeatedly ignored the needs of its specialized and professional non-immigrant workforce and has instead burdened them with delays of up to 11 years for an EB-3 “green card”, the aforementioned absurdly high/inconsistent RFE rates as well as illogical consular delays. These new obstacles are most apparent in the case involving L-1B Specialized Workers, discussed above, or H-1B Professional workers. Unless checked imminently, these missteps could help derail the Nation’s recent tech sector rebound and more importantly, jeopardize our future ability to compete with global competitors. The only logical explanation is unemployment has increased. Adding up govt data from number not in workforce and number not unemployed makes this number as of Jan 1 2014 higher than Jan 1 2009. As with any govt they are answerable to the people and so obviously with a huge number of unemployed people, any govt will crack down on immigration. UK did it explicitly , US seems to be doing behind the back.